Please do not post freebies which require invites. This is a form of referral which is not allowed anywhere on the site. 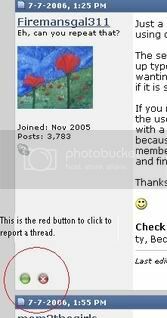 It also leads to members (especially new members who cannot PM yet) posting their e-mail addresses openly on the forum, which is an easy target for spammers. Threads soliciting or offering invites will be deleted, and any member who continues to post these against this policy will be banned. Thank you for your cooperation. Edited by Rockfordmom, Apr 11, 2010 - 7:07 am. Just a quick FYI since we are getting an influx of reposts lately. Perform a simple search using one or two keywords to see if the subject has been posted previously. The search tab is on the top right at the page numbers. Just click it and a box will come up type in your words hit go. Search through all of the hits to see if what you are wanting to post matches. If so don't make a new post but feel free to bump the post up if it is still active. If you notice a repost just click the little red dot under the users avatar (left side, under the user name, the first post in the thread) and in the report post box type repost along with a link to the previously posted item. Don't just type repost in the quick reply box because the board is getting busy with the holidays approaching and several new members a day joining our community it is hard for the moderators to read every post and find the ones that are reposted. Check BELOW if you are unsure as to how and where the search fields are. One of the most important things to know how to do here on the forums is to search. Searching allows you to find what you are looking for quickly, and allows you to check to see if something has already been posted before you make a duplicate. Enter what you'd like to search for and click the "SEARCH" button. Again, just enter what you'd like to search for. You can also choose if you'd like the results shown as threads or as individual posts. From this page you can enter what you'd like to search for, select if you want to find those terms in just the title of threads or in the entire body (including all replies). You can also select specific forums to search within, can search for posts only made by a specific member, and several other options to customize the results. Edited by Rockfordmom, Dec 31, 2008 - 9:41 pm. This seems like a good thing for us to read! Note: since this article was written the fake offer page being described has been taken down. You can still get some good tips for avoiding future fake sites from the analysis below. Like many free stuff scams this Free Headphones Offer[/link] looks reasonable at first glance however, when you take a closer look it becomes obvious it is a fake offer. Read on to learn more about spotting and avoiding bogus free stuff offers. It's peppered with Google ads:There are three sets of Google ads on the supposed free stuff offer page. While some sites may use advertisements to help support their site, this seems oddly excessive. It's hosted on a free hosting site:If you go to the root of the site you will find that the free stuff offer form is on a free hosting site. Not only that, but it is one that requires no registration to use. The legal disclaimer does not fit the site:If you read the legal disclaimer it is pretty obvious that it was copied from another site and modified. The contact email address is a free address:The only way to contact the owner of this free stuff offer is an email address that is hosted at a free email provider. The form doesn't actually collect any information:This is one that you would only notice if you poked around in the HTML code of the page and knew a little about how forms work. This form does not use a script to place information in a database or even to email it to the owner. It does nothing but display a result page that makes you think your data was submitted. The good thing about this is that you won't get any spam from filling out the form. The bad thing is that you will not be getting free headphones either. So, why would someone go to the trouble of putting up a free stuff offer form and not bother to collect the information? There are two possibilities. It is either someone that thinks they can get enough traffic to get revenue from the Google ads, or it is someone that wants to see how gullible people are. Edited by Rockfordmom, Dec 31, 2008 - 9:43 pm. If you have any questions, comments, or anything to add to make our freebie board better please post it in this thread. how do i post a link to share a freebie that i found? Since I saw your posts I'm assuming you have it figured out, otherwise let me know.